NORTH ROBINSON — Last went pretty well for the boys basketball team from Colonel Crawford High School. The Eagles finished with an 18-7 overall record and went 13-3 in the Northern 10 Athletic Conference en route to a second-place finish (tied with Carey) and their sixth consecutive sectional championship. Fast forward to the 2017-‘18 campaign. The Eagles return all but one player from a season ago. But, head coach David Sheldon will enter his 12th season as the Eagles’ leader (178-80 all-time record) with seven returning letterwinners. Among those returning is sophomore point guard Cameron (Cam) McCreary. McCreary earned second-team N-10 honors, second-team District VI Coaches Association honors and honorable mention Northwest District honors in his freshmen season last winter. McCreary posted 11.1 ppg, 6.5 apg (led N-10) and 3 rbg in ‘16-‘17. Other award winners joining Cam this season will be Harley Shaum and Brody Martin. The 6’5” Shaum, entering his senior season, was second-team all-conference last year and scored 8.7 ppg, grabbed 5.2 rpg and was fourth in the N-10 in field goal percentage (58.1 percent). Martin, who stands 6’2” tall, will also be back for his senior season after being awarded honorable mention conference honors last winter. Brody averaged 8.8 ppg, 2 apg and 2.5 rpg during his junior campaign. Colonel Crawford’s other returning lettermen are: senior Hayden Bute (3.2 ppg, 2.6 rpg); sophomores Jordan Fenner (6.7 ppg, 3 apg), Gavin Feichtner (5 ppg, 3 rpg and third in N-10 in three point field goal percentage at 42.9 percent) and Reis Walker (2ppg). Prospects to keep an eye for the Eagles include juniors Zye Shipman and Jacob Maley, as well as freshman Chase Walker. Crawford will run a motion and sets base offense and will set up in a man-to-man base defense. 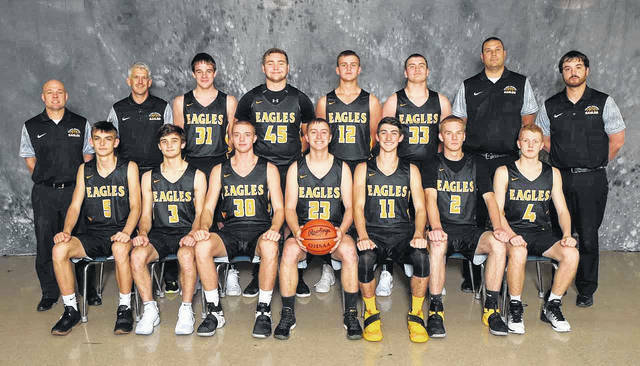 The experience returning for the Eagles will play a huge role in their pursuit of a seventh straight sectional title while the loss of Starkey may present some problems when it comes to defensive rim protection. On the upside, everyone on the squad with the exception of Fenner (5’11”) is at least six foot tall, with Shaum and Walker listed at 6’5”. The usual three teams look to battle for the top of the standings in the N-10 this season. Likely to join Colonel Crawford near the top will be the Upper Sandusky Rams (champions in two of the three previous seasons) and the Carey Blue Devils. Crawford took the conference hardware during the 2014-2015 season and look to put an end to the Rams’ two-year title run. Colonel Crawford will begin their journey on Friday, Dec. 1 with a trip to Mansfield Christian to clash with the Flames in a non-league battle. Conference play will open for the Eagles, at home, on Saturday, Dec. 9 against the squad from Carey. A notable match-up will occur between those two contests as Crawford is set to travel and meet up with the Northmor Golden Knights on Wednesday, Dec. 6. Photo by Photorama of Galion Colonel Crawford boys basketball team. https://www.galioninquirer.com/wp-content/uploads/sites/38/2017/11/web1_Boys-Basketball.jpgPhoto by Photorama of Galion Colonel Crawford boys basketball team.